Etching and aquatint in colors, image 17 3/4 x 23 1/2 inches, sheet 25 3/8 x 30 1/2 inches. Edition of 60. Printed and published by Segura Arts Studio, Notre Dame Center for Arts & Culture, South Bend, IN. $1,200. Six etchings and aquatints with letterpress remarques, after Goya’s etchings of the same titles, image 8 1/4 x 12 1/2 inches each, sheet 16 x 19 1/4 inches each. Edition of 30 each. Printed and published by Kala Art Institute, Berkeley, CA. $1,200 individually or $7,000 for the set of six. Six etchings and aquatints with letterpress remarques, after Goya’s etchings of the same titles, 14 5/8 in. x 11 1/16 inches each. Edition of 18 each. Printed and published by Universal Limited Art Editions, Bay Shore, NY. $950 individually or $9,400 for the complete set of 14 (including eight published in 2012). Enrique Chagoya, Untitled (The Near Distant Jungle) (2014). Enrique Chagoya has significantly expanded his already substantial body of prints over the past two years, working with three different studios and further exploring his established themes, techniques and ideas. In Untitled (The Near Distant Jungle), he addresses the looming problem of rising sea levels that attends global warming, a theme addressed in his 2014 show at George Adams Gallery in New York. Noxious precipitation falls from the sky onto a melee of truncated heads and limbs—suggesting figures both real and imagined (superheroes, pop culture icons, Mesoamerican gods)—that bob in the ocean. 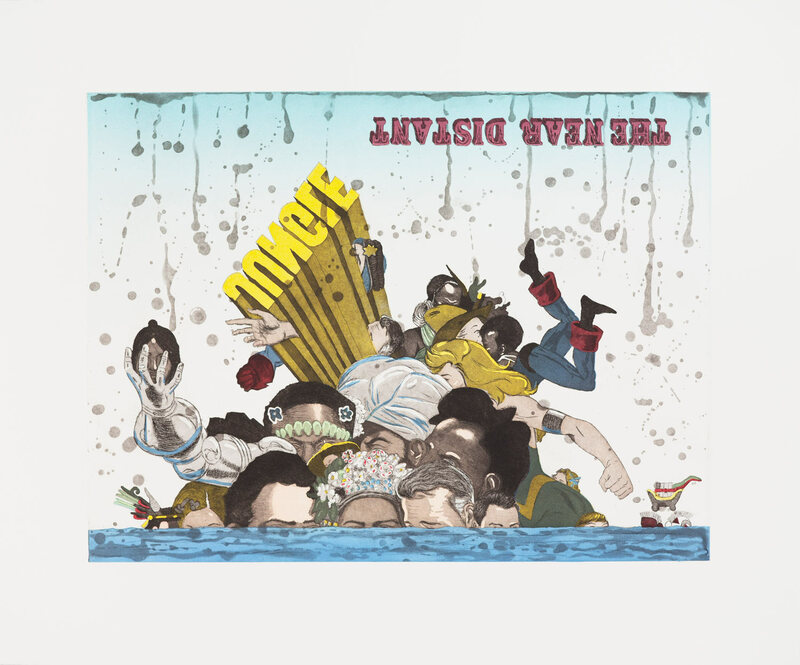 The inverted words “The Near Distant” and “JUNGLE” are foreboding, but the image is also sprinkled with Chagoya’s habitual wit—an arm reminiscent of Buzz Lightyear’s emerges from the jumble to catch an indigenous woman’s head, while a pair of inverted musketeer-like legs scramble in the opposite corner and imp-like Mesoamerican glyphs bob in the water nearby.